ISO 1000. I'm always super skeptical of manufacturer's ISO ratings of their own products as they are often optimistic if not downright misleading. The HD Gold is supposedly ISO 500 though in all the practical testing done by myself and others, it's definitely closer to ISO 250. A 1 stop difference is a big deal and can mean a greatly affected budget for grip and electric. In the case of the Flex, I'd say 1000 ISO is pretty spot on though the blacks and dark midtones are a little cleaner at ISO 800. It's only a 1/3 stop difference and 800 is still plenty speedy. The Flex really is incredibly light sensitive. It's amazing to be able to shoot high speed in low light like this. Internal Capping Shutter. 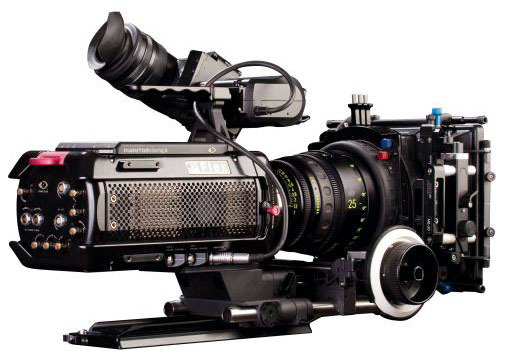 Like the V Series Phantom Cameras, the Flex also has the internal capping shutter which means the AC know longer has to keep the lens cap in their pocket and be ready to assist in a black balance every other take. If the camera is on a crane or is otherwise difficult to access, this is obviously a massive time and energy saver as well. High Quality (HQ) Mode. Instability in the dark portions of the signal has always been the biggest catch of working with Phantom cameras. HQ Mode further addresses the issue by basically performing a Black Reference in-between every frame capture to ensure stability. In HQ Mode, you don't need to perform the Black Balance nearly as often and you'll notice far less banding, noise, and lifted Blue Pedestal than in previous versions of the camera. The only drawback with with HQ mode is that you're capturing frames to the internal buffer, your frame rates ar effectively cut in half. So if you can capture 2500 frames per second in SQ, you can capture 1250 fps in HQ. Not the end of the world, just put the camera in SQ, do a black balance, and capture your shot. The results are just as good, the process is just a little slower. Digital Cinema applications. This isn't something many people are talking about but the 2K Raw 12 bit output of this camera is as worthy a contender for digital cinema applications as any other high end option out there if not better. The only thing holding it back is the cost of the rental - this is a specialty item and priced as such which is probably beyond the means of most productions who would want it for their 6 week shoot. Additionally, the camera doesn't shoot sync sound frame rates. It will beautifully shoot 24 and 30 but not 23.98 or 29.97 so if you want to use it for sync sound, just pretend it's film and establish your workflow and audio sampling frequency accordingly. A friend of mine, Greg Wilson, did some absolutely stunning narrative work with the Flex in collaboration with director, Brendan Bellomo. Please check his blog post for some gorgeous images from their shoot and hopefully the trailer will be up soon. I think they proved with this short that the Flex is a powerhouse of motion picture making, both slow motion and real time. The director who is also a post production expert compared the quality of the 2K Phantom .cine Raw files to a 2K film scan in terms of latitude, faithful color response, and the ability to dig information out of the highlights and shadows. Pretty exciting stuff. In general, the 1080p image on the Flex doesn't seem to be as clean as on the HD Gold. A small amount of noise can be detected in the shadows at all ISO's, the issue becoming more apparent the higher you go. Interestingly, if you capture at 2K and then scale down to 1080p, the noise is greatly reduced. This isn't always the most practical solution but if the highest possible quality is essential, shooting the full 2K resolution is the way to get there. Improved Video Workflow. I haven't tried this but the HD-SDI output seems to be greatly improved over the HD Gold and could probably be recorded to make online quality video files. You're obviously not going to have the flexibility you have with the raw but it's also a lot faster and more economical to walk away with edit ready media at the end of the day. They need to make a cover for the operator side buttons. It's just way too easy to bump them and inadvertently change settings. This is especially true if the camera is being operated hand held. Also, the camera fan blows directly into the ear of the operator. It's really uncomfortable so people are putting gaffer tape over the portion of fan where their head is going to be which makes it a little easier to work with. The camera is incredibly well engineered and executed but these two ergonomic issues become apparent within the first 5 minutes of handheld use.